Artist Georgia O’Keeffe died on this day in 1986. She was 99. While she will long be admired for her art, her life itself revealed an independent thinker, a woman with a creative spirit and mental toughness. From her small town upbringing near Sun Prairie, Wisconsin, to a life amidst high buildings in New York and high desert in New Mexico, O’Keeffe blazed a trail from which women and men can draw inspiration. Whether you like the aesthetic of her paintings or not, it is hard to argue with the fact that she was an artist in the truest sense of the word. She expressed herself and lived life on her terms. It’s clear she was put on this earth to do exactly what she did, and she made decisions along the way that aligned with that purpose. On canvas, this makes a lot of sense. I think it makes sense on the macro level of life, too. 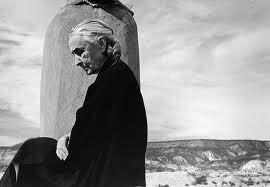 For the macro application, I interpret O’Keeffe’s words Selection, Elimination and Emphasis as Engage, Edit and Act. Engage: By engaging in the world, we discover what nourishes our soul. We are exposed to people, behaviors, attitudes. We find interests, aptitudes, passions. By engaging, we uncover our dreams. By engaging, we get the luxury of selection. Engage. Edit: By editing our lives, we drop the weights that slow our growth. We can edit in several ways. We can say no to unimportant activities that clutter the calendar, and to behaviors that prevent us from being healthy and vibrant. We can edit toxic people from our lives. To exercise restraint or to edit habitual thoughts and actions is often more difficult than doing or exertion. For good reason, many effective leaders espouse a Not-To-Do List over a To-Do List. It’s about discipline. Edit. Act: Action is born of thought and focus. Think it, get fired up about it, do it. Where would you like to go? Plan that. Who would you like to meet? Reach out. Who would you like to be? Take steps to become that. Too often, lack of action is a result of lack of confidence. It’s fear. But great things happen when we face fear, leave the known, and live life with courage. And as long as you don’t hurt anyone in the process, do the thing. Act. This entry was posted in Travel and tagged art, courage, creativity, fear, georgia o'keeffe, Growth, Inspiration, leadership, new mexico, new york, painting, strength, Travel. Bookmark the permalink. Love your reinterpretation of her words…and how you make them relevant to modern-day life! I’ve definitely started becoming more aware of “editing out” things from my life in order to do the things that really matter! Hi Stephanie, I enjoyed reading your blog article here on Georgia O’Keeffe. I’m doing a little research on her and wondering if you know why she made the statement: “I’ve been absolutely terrified every moment of my life — and I’ve never let it keep me from doing a single thing I wanted to do,”? My apologies for the late reply. I don’t know the answer to your question I but look forward to hearing more if you find it. Welcome to On The Road. I'm a freelance writer and producer who loves travel and photography, good people and good food, fitness and design, living and learning. Everything we do takes place On The Road. Let's enjoy the ride. Please check out my Another Door Opens project on http://anotherdooropens.net.